To serve the requisite demands of our esteemed clients, we are engaged in manufacturing, and supplying a qualitative range of Extruder Machine. The offered machine are manufactured by an experienced team of professionals, with in-depth knowledge about the latest trends prevailing in the industry. In addition to this, clients can avail the offered range of machine from us in diverse specifications. Mac well machinery meet the requirements of our prestigious clients, we are engaged in offering Kurkure Making Machines that have main bearing housing fitted with bearing. Manufactured in line with industry norms using the best quality components and sophisticated technology, these machines are optimum in quality. In addition to this, customers can avail these machines from us in varied designs and specifications at nominal prices. We have emerged as the topmost manufacturer, exporter, wholesaler and supplier of Snack Food Extruder. This extruder is specially designed to produce extruded snacks such as; snack balls, snack rings, snack sticks, etc. The provided range is massively applauded for its dependability, resistance against abrasion & corrosion, noted performance, longer service life and sturdy construction. Moreover, this extruder is obtainable in varied technical specifications to fulfill the variegated requirements of customers. 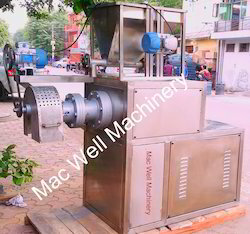 Mac well machinery meets the requirements of our prestigious clients, we are engaged in offering Corn Puff Making Extruder that has the main bearing housing fitted with bearing. Manufactured in line with industry norms using the best quality components and sophisticated technology, these machines are optimum in quality. In addition to this, customers can avail these machines from us in varied designs and specifications at nominal prices. We have emerged as the topmost manufacturer, exporter, wholesaler and supplier of Rice Extruders. This extruder is specially designed to produce extruded snacks such as; snack balls, snack rings, snack sticks, etc. The provided range is massively applauded for its dependability, resistance against abrasion & corrosion, noted performance, longer service life and sturdy construction. Moreover, this extruder is obtainable in varied technical specifications to fulfill the variegated requirements of customers. Owing to the years of industrial experience, we have been able to serve our valued clients with a wide machine of Puffed Rice Making Extruder. The offered extruder is precisely designed by our experts using premium quality components and progressive technology. Further, we check this extruder on different parameters before their final dispatch in order to make sure that this is in compliance with the global quality norms. We have emerged as the topmost manufacturer, exporter, wholesaler and supplier of Snack Corn Puff Extruder. 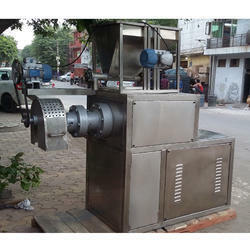 This extruder is specially designed to produce extruded snacks such as; snack balls, snack rings, snack sticks, etc. The provided range is massively applauded for its dependability, resistance against abrasion & corrosion, noted performance, longer service life and sturdy construction. Moreover, this extruder is obtainable in varied technical specifications to fulfill the variegated requirements of customers. We have emerged as the topmost manufacturer, exporter, wholesaler and supplier of Corn Puff Extruder. This extruder is specially designed to produce extruded snacks such as; snack balls, snack rings, snack sticks, etc. The provided range is massively applauded for its dependability, resistance against abrasion & corrosion, noted performance, longer service life and sturdy construction. Moreover, this extruder is obtainable in varied technical specifications to fulfill the variegated requirements of customers. Our organization has achieved recognition as a flourishing organization for providing Puff Extruder. Our provided puff extruder is manufactured and designed using premium quality components and leading technology that ensure its optimum quality. Our offered puff extruder can be purchased in varied technical specifications as per the application demands of the customers. Moreover, clients can get the provided products from us at very affordable prices and within given span of time. We are the supplier of the Snacks Food Extruder to our clients. With the support of our deft professionals, we provide our customers a high quality Pola Extruder. This bambo extruder is assembled by our professionals using leading technology with superior grade components to attain maximum gratification by catering the requirements of customers. Owing to its varied quality attributes, provided bombo extruder is widely praised by our esteemed patrons. We offer this product to our clients at market leading prices. Owing to the years of industrial experience, we have been able to serve our valued clients with a wide machine of Maize Puff Making Machine. The offered extruder is precisely designed by our experts using premium quality components and progressive technology. Further, we check this extruder on different parameters before their final dispatch in order to make sure that this is in compliance with the global quality norms. We have emerged as the topmost manufacturer, exporter, wholesaler and supplier of RicePuffs Extruders. 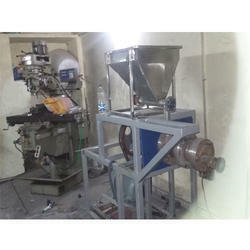 This extruder is specially designed to produce extruded snacks such as; snack balls, snack rings, snack sticks, etc. The provided range is massively applauded for its dependability, resistance against abrasion & corrosion, noted performance, longer service life and sturdy construction. Moreover, this extruder is obtainable in varied technical specifications to fulfill the variegated requirements of customers. Staying informed concerning current business sector advancement, we are putting forth a wide combination of Puff Making machine. we are the leading manufacturer and exporter of Puff Core making machine.